The fruit basket is used as an alternative to cut or living flowers. It is often arranged in similar manners and may include a theme. These edible bouquets are often available through a local florist. There are many options available when creating these gift baskets. There are many ways that they can be customized to get better results. Understanding the basic concepts can make creating them simple. The original concept is a simple gift container, often baskets. These may be made from wicker, bamboo or other woven vine materials. These will be used to contain all of the ingredients for the gift. The material is often treated to prevent it from cracking or breaking. This may be a simple glossy coating, or a durable sealant for some. It will also help to prevent splinters or moisture from occurring. The base is often covered by a few layers of fabric, gauze or tissue. This will help to protect the fruit that will be added later on. The material used may be simple, or an elaborate pattern if desired. Once the bottom has been covered, base levels are sometimes added. These may be simple containers turned upside down or a florist foam. These provide multiple layers to lay the edible arrangement on. Many designers choose to use several levels to give the basket height. This can help the edible arrangement to appear fuller and larger. It can also highlight particular selections within the fruit gift. The most basic options for a fruit basket include apples and oranges. These are a staple as they are often widely enjoyed by all ages. Several varieties may be included to create a mixed assortment. For apples, Red Delicious, Granny Smith and Gala are top choices. For oranges, the classic version may be used or a specialty hybrid. Some may also choose to use nectarines or tangelos when available. 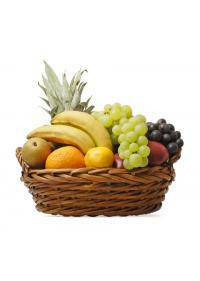 Bananas and tropical fruits may also be used for some basket setups. Bananas must be selected carefully as they may be under or over ripe. They can also attract flying insects so caution should be taken. Tropical fruits often make any gift arrangement feel more exotic. Kiwi, mangoes, coconut or pineapples may be used for added flair. Coconuts and pineapples are often cut prior to adding to the gifts. Berry assortments are also popular for a more updated arrangement. Strawberries, blueberries and raspberries are among the top choices. Cherries or other small fruits may be added to berry assortments. The types of fruits available vary greatly from place to place. Large selections of fruits and basket designs are made available in locations nearby Albuquerque, NM, Santa Barbara, CA, Flint, MI, Warwick, RI, and Midland, TX. Requests for certain fruits can be made if an order is placed early in the day, or if ordered days in advance. Once the edible portion has been arranged, it must be wrapped up. Cellophane is often the best choice to keep the products fresh. Clear or colored cellophane may be used to finish the packaging. A large piece of cellophane should be laid out on a table or desk. The base of the container should be placed directly in the center. The cellophane should then be gathered and wrapped upward around it. Once the wrapping has reached the top, it needs to be tied or sealed. A rubber band or twist tie can help to hold the opening closed. Colored ribbons are often used to tie and decorate the fruit basket.